Cocktail / Evening suit. Christian Dior Couture. 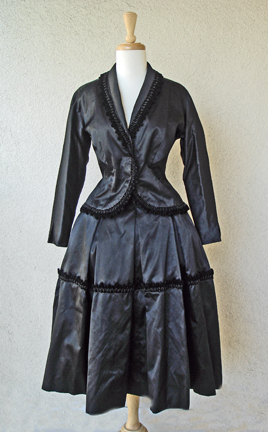 Two piece suit consisting of a jacket and midi length skirt of butter black satin trimmed with a velvet and jet fringe. 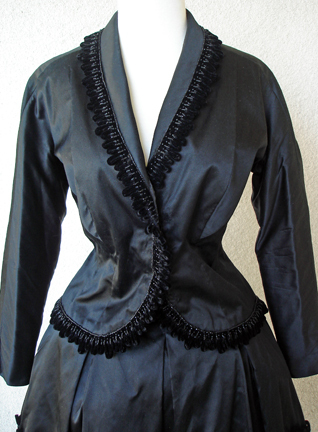 The fitted jacket is constructed on princess lines with raglan sleeves, a cutaway closure and small peplum. The full ballerina length skirt consists of unpressed box pleats and trim at thigh level. 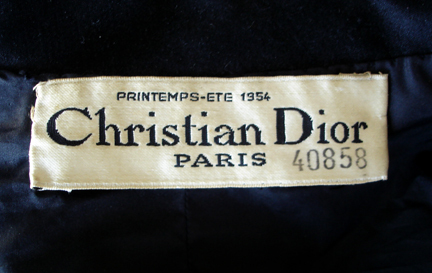 The style of this suit epitomizes the hourglass silhouette of the New Look for which Dior was famous: the rounded shoulders, small waist and full skirt. However, it also documents the subtle influence of Balenciaga in that his classic form is achieved without boning and padding by using princess construction and trim to emphasize the width of the peplum and skirt. The soft rolling collar echoes the volumetric quality of the suit. This line was called “Lily of the Valley” and placed a new emphasis on organic construction (the princess lines). The width of the bust evolves out of the stem of the waist which is anchored in the ground (hips and peplum). In comparison with other examples from this line, this piece was a pre-cursor of the H line which was shown in the fall / winter of 1954. 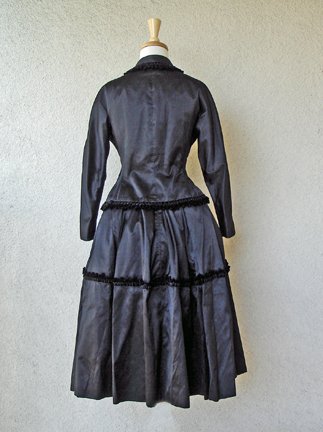 In the H line, the whole torso was outlined (the fitted jacket without a line cutting the waist) and was then mounted onto the flared full skirt. This was perceived at that time as youthful. Because it was so expensive to mount a new line and the clients paid so much per piece for their acquisitions, changes were usually slow and incremental although the fashion press needed to accentuate any innovation, often out of all proportion to reality, to justify their existence. Although the New Look was already 7 years old, its silhouette was still dominant. Dior was the most important house in Paris (in economic terms) at this time with everyone watching his line for leadership. However, experts could detect differences which were carefully monitored. 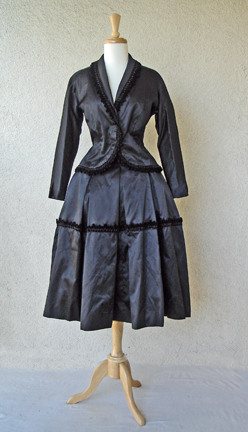 jacket: bust: to 38"; waist: 32"; length: 23"; sleeve: 19"-20"
skirt: waist: 26"; length: 30"
Condition: excellent. The closure of the jacket was originally held in place by hooks with thread eyes. These broke and the original wearer added heavy metal snaps. These have been professionally removed and the original thread eyes have been reconstructed. However, marks have been left by the snaps though they are not visible when the jacket is closed and worn or installed.